That recurve looks pretty solid. What kind of bow is that? Also nice shooting. Looks like a nice heart shot. The bow is a Harrleson T/D recurve made by Lynn Harrelson of Fitzpatrick, AL. The arrow entered the left side of the rib cage and exited right side clipping the right lung. nice shoot'n, nice buck! Congrats. 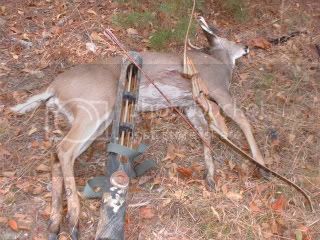 Every deer I take with my bow in SC is a gun season bow kill.I'm in the lowcountry and we don't have any seperate seasons.I have to put up with dog hunting and guns blasting from day one till the closer. I understand what you mean. When my father was living, we belonged to a dog club in Denmark. I like the hunt clubs for the sake of fellowship. Met some good people and made some good friends. But I always wanted a place down their to just stand hunt. And some of the deer down there are are monsters! We had a lot of dairies around the property. But I actually found a spot not far from there that I will be hunting next season. What kind of trad gear are you shooting? Depends on my mood at the time.Spent most of the season with my BBO Longbow 66" and #50ish @ 28".But,there's also a Jeffery recurve,a Dwyer Longbow,a Tomahawk Diamond Longbow that make it to the woods too.Soon to be a Schafer Silvertip Longbow(2pc and a 3pc),man I'm getting too many bows......Like wood shafts for all of them,mainly POC for the lighter bows and Birch for the heavier poundage bows.